Our first speaker of the semester, Roberto Bosch Cabrera, has generously provided us with a set of problems and solutions. The concepts behind these problems should be very helpful to our students preparing for the next set of AMC contests. In addition, the art of writing excellent articulations like Roberto’s is critical to advancement in mathematics and is applicable to a variety of other fields. Here are the first two problems and the solutions which you will find in the attached Adobe Acrobat File (pdf). 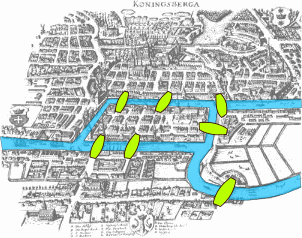 Graph theory was born when Leonhard Euler solved the Seven Bridges of Koenigsberg problem and has since grown into a mathematical discipline with beautiful theoretical results and with applications in disciplines like theory of dynamic systems, electrical engineering, computer vision, neuroscience, and social networking. Each of 17 students talked with every other student. Each pair of students talked about one of three different topics. Prove that there are three students that talked about the same topic among themselves. Best of luck at the state competition in Austin! Bulgarian Olympiad winner, Krassimir Penev will consider a variety of problem-solving techniques and important facts used for solving nonstandard geometric problems. 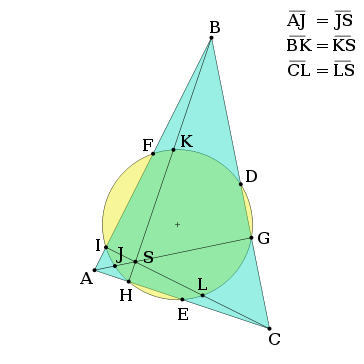 The examples include but are not limited to the Nine Point Circle, Euler’s line, Ceva’s Theorem and cyclic quadrilaterals. These mathematical tools could be used for math competitions such as the AMC10,12, AIME, USAMO and Intel talent search. We will plan to meet right after the MATHCOUNTS Chapter competition.